The Westinghouse brand has been well known since the late-19th century, but the man behind the brand—George Westinghouse—is not. He founded dozens of companies and transformed the world with his technological achievements. But, today, few besides engineering and technological-history buffs remember George Westinghouse, who was responsible for two key inventions that have touched millions of lives. Just after the Civil War, he invented the air-brake system, a quantum leap in railroad safety. Thirty years later, he was responsible for the triumph of alternating current (AC) power, making electricity viable for domestic and industrial use. Westinghouse was born in Central Bridge, New York, in 1846. He apprenticed at his father’s company, Westinghouse Machinery Co., learning mechanical design and drawing. As a junior engineering officer on a US Navy vessel during the Civil War, Westinghouse honed his engineering skills along with a sense of discipline and service—qualities that informed his life and career. George Westinghouse in 1910. Courtesy Detre Library & Archives, Heinz History Center. Before Westinghouse invented the air-brake system, passenger and freight trains employed a brakeman to manually turn handwheels on top of each car, engaging the brakes individually. It was dangerous work and ineffective—trains could take two miles to come to a halt. Westinghouse’s system connected the cars with compressed air lines that activated the brakes simultaneously. The new braking system reduced braking distance from thousands of yards to hundreds, saving untold damage and hundreds of lives each year. “This revolutionized train safety and travel,” says Emily Ruby, curator of the Heinz History Center, which maintains a large Westinghouse collection. The success of the Westinghouse Air Brake Company (founded in 1869 and still in business) allowed Westinghouse to explore other fields. In 1885, an article in the English journal Engineering sparked his interest in AC electrical systems. This eventually brought Westinghouse into contact—and conflict—with the major inventor of that era: Thomas Edison. 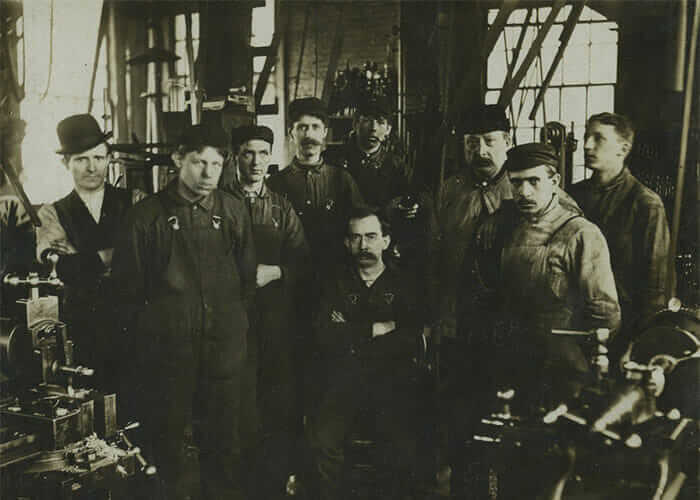 A group of Westinghouse Air Brake Company workers in 1895. Courtesy Historic Pittsburgh/Detre Library & Archives, Heinz History Center. But low-voltage DC could be transmitted only a few thousand yards from its source. This was viable for small towns, where a central DC power station had adequate reach, but for cities, it was unfeasible. While Edison invested in DC systems to power stock tickers, telegraph machines, and incandescent bulbs, Westinghouse saw greater potential in the more-difficult-to-master AC. His breakthrough was recognizing the similarities between AC power and compressed-air or natural-gas transmission systems. Discover more visionaries in the “Respect” series. Natural gas used for lighting or heating is produced at high pressure, which allows transmission over long distances. At the point of use, the pressure tapers to safe levels using a reducing valve. In electrical current, voltage is analogous to pressure, and high-voltage AC power can be transmitted over long distances. At the point of use, a device called a transformer acts as a reducing valve, stepping down the voltage to safe levels for home and industrial applications. 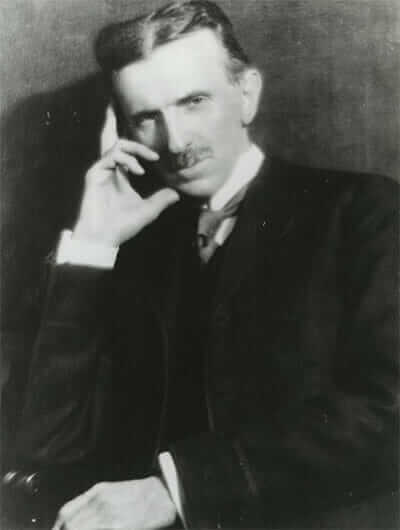 Serbian inventor Nikola Tesla. Courtesy Historic Pittsburgh/Detre Library & Archives, Heinz History Center. In 1885, Westinghouse bought the US rights to a transformer patented by the French-British duo Gaulard and Gibbs and immediately set about improving it. Working with the brilliant Serbian inventor Nikola Tesla, Westinghouse produced the first practical AC-power generation and distribution systems, based on Tesla’s designs, as well as a lightbulb that competed with Edison’s incandescent bulb. The greatest achievement in AC power, however, came when Tesla developed the first practical AC electric motor. Producing no dangerous sparks and reducing the components subject to physical wear that DC motors required, AC motors were the key to industrial applications for AC power. Although Westinghouse was designing an original system, not a copy of Edison’s DC system, Edison engaged in a public-relations battle with the Westinghouse faction, denouncing high-voltage AC power as dangerous, even lethal. Edison went so far as to encourage its use in the first electric chair for executions, proposing the slanderous term “Westinghousing” for execution by AC current. A view inside the Electricity Building at the 1893 Chicago World’s Fair. Courtesy Historic Pittsburgh/Detre Library & Archives, Heinz History Center. The Westinghouse-Tesla AC-power system won out in the end. Notably, the Westinghouse Electric Company also won the contract to illuminate the 1893 Chicago World’s Fair, where it designed, built, and installed a complete AC central station, powered by a 2,000-horsepower Allis-Chalmers steam engine and a dozen 1,000-horsepower engines. 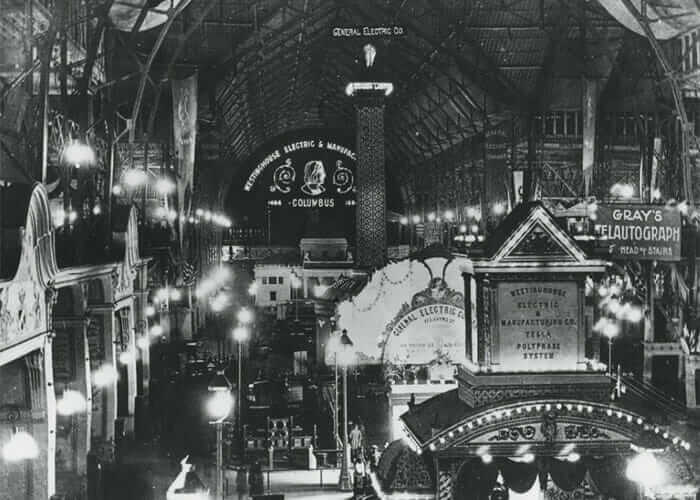 The generators powered over 160,000 Westinghouse-designed lamps in the fair’s pavilions, plazas, and walkways—all controlled from a central switching system overseen by a single operator. The death knell for DC power was struck by the Niagara Falls Power Company on November 16, 1896. Its ambitious project directed water from the Niagara River through a huge subterranean tunnel, spinning Westinghouse turbines and generators and providing electricity to the industries of Buffalo, New York. Financial manipulation during the Panic of 1907 by J.P. Morgan (an early Edison backer) wrested control of the Westinghouse Electric Manufacturing Company from its founder. While the air-brake company and several other concerns remained under Westinghouse’s control, it was a blow that he never seemed to recover from. His health declined, and he passed away on March 12, 1914, aged 67. 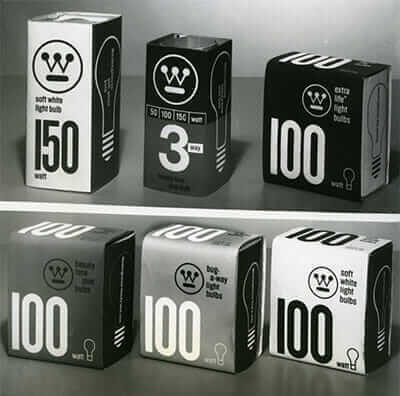 These 1968 lightbulb packages display the iconic Westinghouse “Circle Bar W” logo, drafted in 1959 by renowned graphic designer Paul Rand. Courtesy Historic Pittsburgh/Detre Library & Archives, Heinz History Center. Although the Westinghouse brand thrived well into the 20th century as a household name for kitchen appliances, radios, and midcentury industrial electrical products, the Westinghouse Electric Corporation was gutted in the mid-1990s, disassembled for its assets. Its industrial and technology divisions were sold off to the highest bidders, and only the media component (one of the original Big Three American radio, and later television, networks) remained. 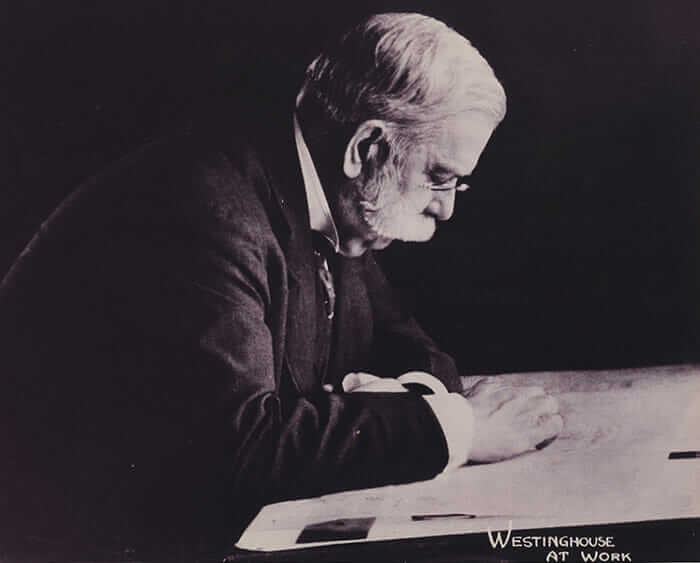 Despite his descent into anonymity, Westinghouse remains a giant of the early years of industrial technology. 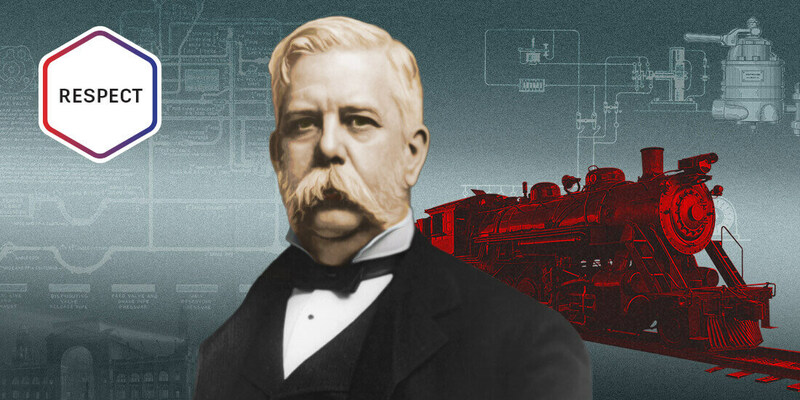 As the man behind key technologies in transportation and electrical power—though not as visible to the public as Edison’s phonograph, movies, and lightbulb—Westinghouse was instrumental in shaping today’s world. Asteroid Mining: Who Wants to be a Trillionaire?